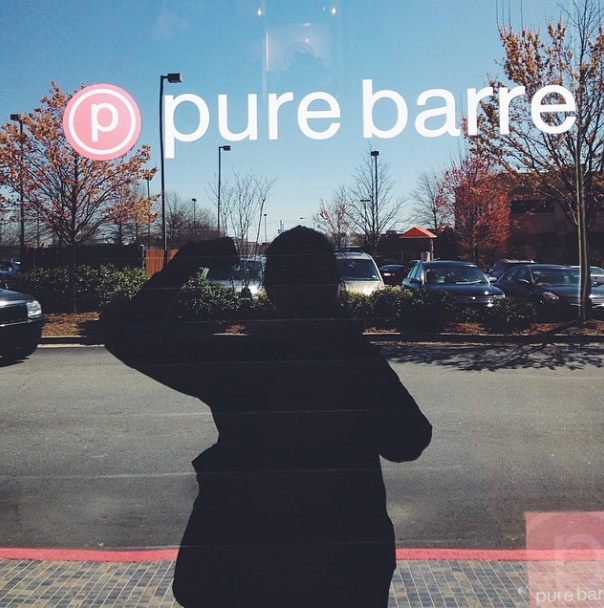 This past Sunday, the crew at Pure Barre Athens invited me out for a complementary class. Instead of my usual Sunday routine of brunching and errands, I got to really do it bit this week with Pure Brunch AND Pure Barre. I'd taken a few free community classes over Christmas, so I was excited to come back. There are around 200 Pure Barre studios nationwide, and the Athens studio in the Alps Kroger shopping center is less than a year old. To me, Pure Barre feels like a combination of ballet strength conditioning, isometric muscle building, and pilates. You're reminded to keep your tailbone tucked under, with your stomach pulled in and your back straight. A ballet barre, small exercise ball, and stretchy exercise tubing work their way into the repertoire of movements. While the movements and poses are approachable enough for anyone to do, Pure Barre is by no means an "easy workout." If I'm going to spend an hour working out, I like knowing I've pushed myself to my limits. During the poses where the muscles in my legs were shaking uncontrollably, the instructors reminded us that that's a good thing: that means you're working your muscles to the point of fatigue. It's no cake walk, but it's not impossibly hard, or one of those work outs where you swear you're going to collapse or puke, but you're too embarrassed to leave early. It's an enjoyable challenge, and challenge enough to take your mind off anything that might be bothering you that day. I really benefitted from the class setting. On a self-directed work out, I typically either become bored too soon, or only push myself 80%. The class was fast paced and varied, so my mind stayed engaged and entertained. An hour blew by. Sometimes I was unclear on the instructor's directions, so I really appreciated that she frequently came around to correct us, make sure our form was right, or help us lean into a stretch further. It's a good idea to wear leggings and a form fitting shirt, so your instructor can see how your body is aligned. Based on how my entire body felt like Jello after class and how sore I was the next day, even in places like my ribs which have never been sore after a work out, I'm confident that in only an hour, I pushed myself hard, in every area of my body. I wish we'd stretched a little more before and after, but there's time to do that on your own. I also liked that you reserve a spot ahead of time for class, so that class sizes are manageable and not overcrowded. I would love to go back, but the price point falls well outside of my means. I know, I know... it's all about priorities, what's more important than your health, etc., etc., but I'm currently in a place where I barely break even each month, provided a medical bill or car repair doesn't pop up. With packages ranging from $20 per class to $1,795 for a year unlimited, regular Pure Barre visits aren't an option for me. If I was at that stage of life, I feel like the "baby bounce back" or "bride-to-be" specials would certainly whip me into shape quickly. In the meantime, I'll have to keep an eye out for some kind of crazy special, or wait for the next free community class. Disclaimer: as stated in the first line above, Pure Barre invited me in to try a free class.